Bill Warren has been a licensed pilot since 1962. Since then his career has included: crop dusting, aerial firefighting, bush flying, weather modification, aerial advertising, air ambulance flying, executive charter, and flight instruction. Bill is best known for his work as an Airshow & Motion Picture stunt pilot. His flight experience spans airplanes, helicopters, sailplanes, ballooning, and parachuting. 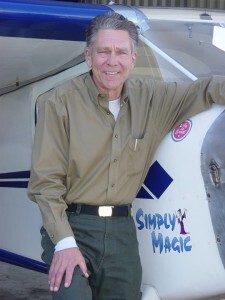 Over the years Bill has extensively studied how people learn and applied that learning to develop the “Simply Magic” technique of flying. Bill ‘went West’ September 29, 2011.